Well, since I have much free time today.. so? It's time for blogging now! *Yayy* XD Haha. Anyways, I just wanna share news plus video for you. It's about a teaser trailer for the specific. Yeah, yeah. FOOL COOL ROCK! ONE OK ROCK DOCUMENTARY FILM !!! Well, OOR have announced the release of a new documentary covering their latest tour called "Who are You?? Who are We??" The documentary is titled, "FOOL COOL ROCK! 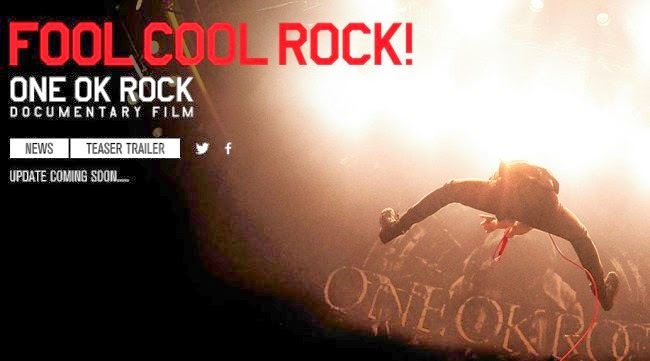 ONE OK ROCK DOCUMENTARY FILM", and it would be released in Japanese theatres from 16 May to 5 June 2014. You can also visit their official website. Here! <--click it, click it, click it. And here is the teaser trailer I'm talking about. Check it out! Okay, it's time for me to go. Will come back sooner or later! Haha. Thank you very much dear friend Vania for your visit, good weekend with happiness and smiles. Hugs Valter.